One of my summer goals is to plow through several patterns and projects I have laying around. Am I the only one who picks up sewing patterns and fabric, or knitting patterns and yarn, and then let's them sit around for a couple years? I know I'm not. It's a time honored family tradition that runs deep down my maternal line. As I was thinking about why I don't get as many projects I want done, I realized that one of my biggest hurdles is that when I had the urge to work on a project, I couldn't easily find the pattern. The digging through piles and web pages to find the patterns cut into my crafting drive. Decorated binders with clear sleeves inside have helped. I grabbed a run-of-the-mill one inch binder, little scrapbooking paper, some letter stickers, buttons, embroidery floss, two strips of ribbon, and some clear vinyl sleeves. If you're more organizationally minded than me, you could put in dividers for different types of patterns - knitting versus sewing, or pants vs. skirts, etc. I didn't bother. It's progress enough that my patterns are in one place now. A box would work too but I like flipping through and it works well since so many of my patterns are printed from the internet now. Will that Barcelona skirt make it's way to the top of the list now? We will see. It's in line behind the Hourglass Sweater I started a couple years ago (sleeves attached, yoke to finish), the Juliet sweater that's almost done, the Debbie Bliss baby shrug for my niece Ella that I started this week, and a Heather Ross Medocino sundress for Ella and hopefully me too. A friend has a saying that comes in handy. "Yeah, I need to bring that back into my life". As in, "I had a glass of wine last night for the first time in a long time and I realized that I need to bring that back into my life." Or, "I miss scrapbooking. I'm bringing that back into my life." This is what I've produced so far this week, and I'm telling you, there's more to come. Also, if you're a paper addict like me, I highly recommend this packet of random papers from the etsy shop jedgell. That's where the action steps paper on the March layout came from. Lots of great papers perfect for journaling. Just a quick prompt for those following along with the 2009 Mini-Album project to pick out your favorite photos from January-March. 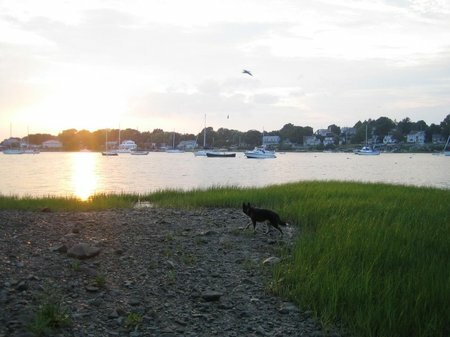 I chose some photos that I posted on the blog, but only if they truly were my favorites. Instead, I looked for photos that evoked an emotion or memory rather than photos that were technically the best. I also included some photos of my niece that were sent to me, since waiting for new email updates has been a fun part of the last few months. At the end of the year, I want a small album that I can flip through and remember what my life was like and what was important to me during this time. If I've learned one life lesson from scrapbooking, it's that time changes things and over time you'll lose perspective on the details of your life. It's natural. You can't hold on to the past too tightly, but something about staying close to what mattered before helps me pay attention to what matters right now. I swear Winkflash isn't paying me (and no, I didn't win the Winter Vacation photo contest), but I wanted to share that you can order a bunch of different sizes from them now. They offer a 4"x5.3" size for 8 cents that I think will fit nicely into my 5" x 5.5" album. No need to order the more expensive 5"x7"s that require cropping. Right now I prefer easy over perfection. Lastly, I'm planning to update the banner. Winter is so over. I saw a few bulb flowers pushing their way through the ground yesterday and I need to get the camera back out to record the early details of spring before we are surrounded by green again. I love a good mess. Is that a crime? Sometimes I feel like it is. I had a little scrapbooking party Saturday night and I still haven't picked up. Having stuff stren about inspires me. I sat down Tuesday night and started a page for March. I wouldn't have done that if I'd already put stuff away. I think tonight I'll make another page or two, then give a clean dining room back to my long-suffering husband. ...a simple and DONE project! I have a serious problem with unfinished projects. If another month had passed, this project would have been added to the pile of the undone. Awhile back I bought the insides to a reusable planner with plans to make my own cover. I think it cost about $7. Now in early February, this probably costs about $2 if you can find it. To make the cover, I picked out a favorite sheet of patterned paper and cut it to size. Then I added the 2009 stickers and the sticker strip. I knew the cardstock would not hold up and the stickers would fall off over time, so I decided to use a modgepodge-like sealant on the front and back. After sealing the paper, I glued it to a heftier piece of cardstock for stability. Then I did a little stitching, because a) I love stitching, and b) I thought the cover would hold together better over time. That's it. Oh, and I punched holes in it and added rings I got from an office supply store. Aside from the drying time, the project took me about an hour and a half. My January 2009 schedule will be perpetually free, but February is already filling up. I was cleaning up my scrapbooking space today and ran across a 2009 calendar mini-album I bought. I thought I would describe the project I have in mind, and invite others to join along. 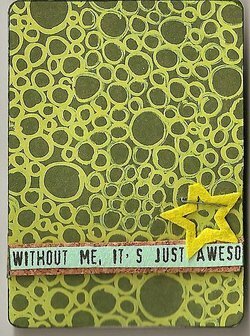 Never scrapbooked, but wanna try? This is a good place to start. I can think of two approaches to this project. Both would be fun. Another approach is to pick one day a month - like the 1st or the 15th - and commit to carrying your camera around that day to document your everyday life. This would be pretty cool over the course of a year, because the day would likely fall on a Monday one month or a Sunday another month. It would be a fun way to track your routine and to see changes in your life over time. The downside is that you have to remember, which is why I'm not going to do that this year. I'm forgetful! Whichever approach you choose, the supplies you need to complete it are fairly basic. 2009 Calendar Mini Album from Elle's Studio. I ordered black (on sale) but you may be more fun than me and want some color. The album comes with 1-inch rings to hold the album together. It also comes with a blank cover, although it is not very sturdy. You may want to make or buy an album cover. I plan to make my own cover with chipboard I have on hand. You could also glue or sew two sheets of cardstock together for a study cover. I will have to cut the cover to size, punch holes in it, and decorate it. You could also buy an album cover. Here are a couple possibilities. 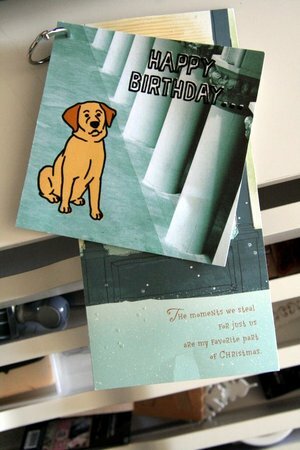 Other supplies you'll need are: a pen, a glue stick, and some plain white cardstock for journaling. If these are acid free, even better. 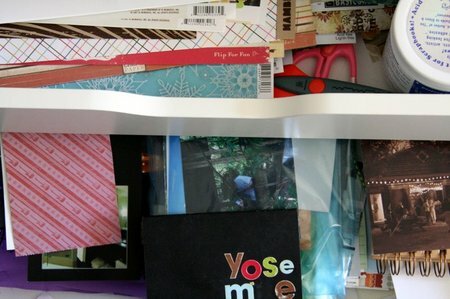 The tools you need are a hole punch and a paper cutter or an exacto knife and ruler. If you want to add some stickers for journaling directly onto your photos, here are a couple small stickers that I recommend: some small rectangular stickers by 7Gypsies or journaling spot stickers from Making Memories in black or in various colors. Also, these tiny alphas from Making Memories are fun in black or color. 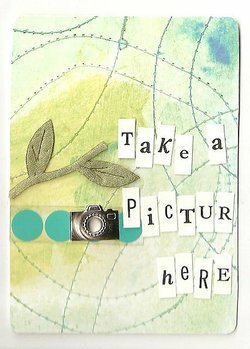 Lastly, I a designed 5"x5.5" journaling block for you to cut out and adhere your photos to. It is a downloadable pdf. If you're interested in joining along, let me know. If there are a few people, I'll post a reminder for you to pick out and print photos once every quarter. 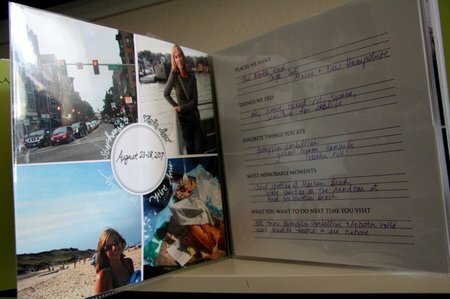 I'll also write up a tutorial on putting the album together once your photos come. ** You can order prints whenever you feel like it. I'm going to try to print them about every 3 months and put this album together in 4 sittings. I've looked around for pricing on 5x7's. The cheapest printing I have found is Winkflash where you can get 5x5s or 5x7s for 25 cents. Great deal. 5x5s would be good if you don't want to punch holes in your photos. Most 5x7s I have found cost between 70-99 cents a piece. You could also use 4x6s and cut them down to 4x4 of 4x5. Mini-albums have become a favorite thing to give to friends this year. 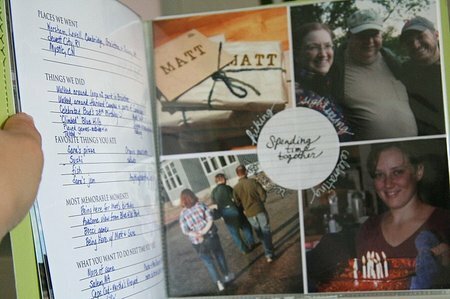 I can do the fun work of decorating the album, and they can do the hard work of inserting the photos. Okay, that sounds selfish, but I think it's a win-win situation in the end. I made this mini-album below for the birthday of a friend who went and fell in love this past year. It got me thinking that I should make an album of my favorite pictures of Matt. This album would actually work well for a baby boy or girl too. So, my creative process on this one -- I started out with the idea of "the boy", which I thought of around midnight the night before her birthday party. Too late to execute, so she got it later in the week when we went out for dinner. First off, I found one piece of patterned paper I liked a lot (from love, elsie), a label, and some letter stickers (making memories kraft stickers and love, elsie). Then, I grabbed a tabbed chipboard album, painted it in white gesso for a base coat, then sloppily painted the inside pages alternately grey-ish blue and brown. Standing the album up on its end and splaying out the pages while painting helps with this so you don't have to wait for the paint to dry each time you paint a page. I started with the brown pages. And once those dried, I painted the blue pages the next day. The only problem with this technique is that the paint can be a little sticky even when dry, and the pages, especially the bindings can tear a bit when you open the pages. You have to be okay with imperfection. The last step was pasting the patterned paper on. I pasted one side of the album down to the whole sheet of paper, then cut around the edge with an exacto knife. The next step was the fold to apply paste to the other side of the album and fold the paper around. Then I cut around the edge again. I applied the label and it was done. Since I'm in graduate school and have way too much on my plate, I'm finding that projects I can work on over the course of several days work best for me. I seriously picked out the paper and stickers one day, painted the gesso one day, then the blue pages another, then the brown, then pasted on the cover. It was a 5-day project, about 15-20 minutes a day. It seems like forever since I've done a scrapbooking post. To which I hear my Aunt Leanne saying, "And that's a bad thing?" But with the return of school and the reorganization that continues to go on around here, I've had more interest in scrapbooking. Nothing motivates me to scrapbook quite like procrastinating homework. One of my friends had a birthday this Friday. Late this summer I had an idea for an album for her. One of her regular refrains when bad things happen is "God hates me". I've told her I wanted to start charge her each time she said it. 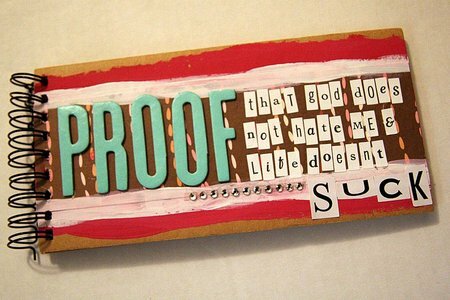 Mainly because I was tired of hearing myself say, "God does not hate you." To which she would say, "Yes, he does." I'm sure I said at some point, "And how do you know he's a he?" When I showed the album to Matt he said, "That's kind of harsh". He had me worried, but I was right. She LOVED it. I told her to print some pictures and then come on over so I can convert her to the church of craft. Actually I told her I'd help her finish the album, but I think she knows my hidden agenda. Later that night, some of the letters started falling off the album. She asked me how to stick them back on. I said, "Don't worry, I have several types of glue." She said, "Of course you do." When we moved back into our apartment, Matt and I renegotiated where everything was going to be stored and I convinced him to let me put my scrapbooking cart in the dining room, since that's where I most often scrapbook. Plus, when it was in the "office" (aka the corner of our bedroom) the scrapbooking stuff would spill over onto the computer desk and that was a real nuisance to him, and even to me. This past weekend I spent some time reorganizing all the stuff. Notice the papers. I'm generally disorganized but I've always loved organization by color. I love this cart because it is compact, it is on castors, and it holds A LOT of stuff. 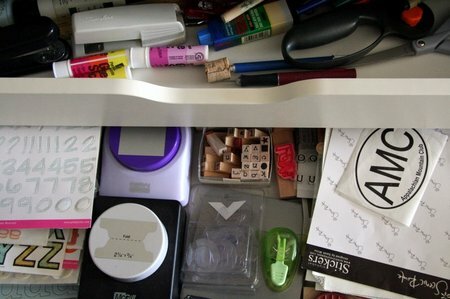 Paints, glue sticks, staplers, scissors, pens/markers, letter stickers, punches, letter stamps. 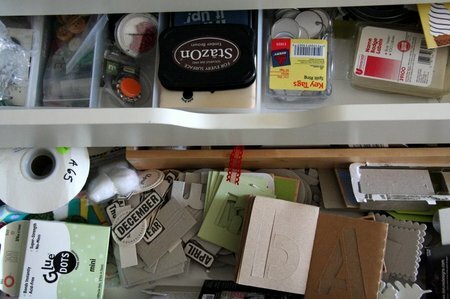 Buttons, stamp pads, embellishments, ribbons, adhesives, and chipboard. A big stack of paper, paste, pictures, and unfinished albums. I think this reorganization is going to jumpstart a new wave of scrapbooking. Clearly, I have more than enough materials to keep me going for awhile. I'm feeling much more motivated to approach this hobby the fast and easy way. A couple months ago I thought of saving favorite cards by just punching a hole in the them and putting them on a ring. Easy peasy. Got that started today. 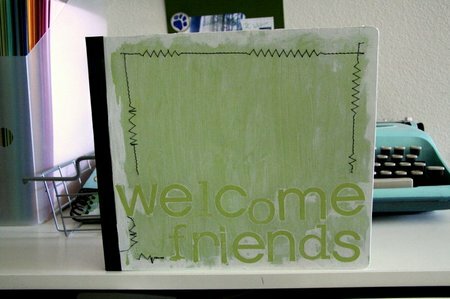 And late last summer I made an 8x8" mini-album just for visitors. I created a short survey for them to fill out about places we went, things we did, favorite things they ate, most memorable moments, and what they want to do next time they come. I put letter stickers on the cover, but I didn't like the colors, so I painted over them in white paint, rubbed off some of the paint after it started to dry, and then peeled the stickers off. I made the inside easy too so that this wouldn't be a hard album to maintain. Four 4x6 pictures cut into 4x4s on one side with the survey filled out by our guests on the other side. 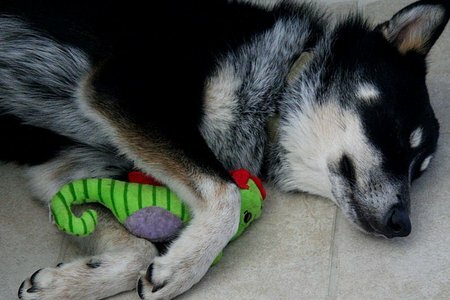 And since I can't seem to post without a puppy picture, here's Kaia papaya enjoying a new toy from our neighbors. Almost 9 months old, and no longer looking like a puppy but still acting like one. Everything we own is now back in our apartment. Most of it is in boxes, but it's back in. I'm not particularly in a rush to unpack it since things are somewhat neater around here without all that stuff about. But, tomorrow is the serious unpacking day. Every room is getting a make-over, and so far our space seems much more functional. Hopefully this will still be the case once all the boxes are emptied. I'm sure everyone experiences this. When you move, you swear you will buy less stuff from now on. You realize you can absolutely get by with less. Especially in the United States where accumulation is a way of life. Matt and I were discussing just that on the afternoon we finished packing up every last pen, and bowl, and ball of yarn, and drumstick. I even told him that I didn't want anything for my birthday that would ever need to be moved. 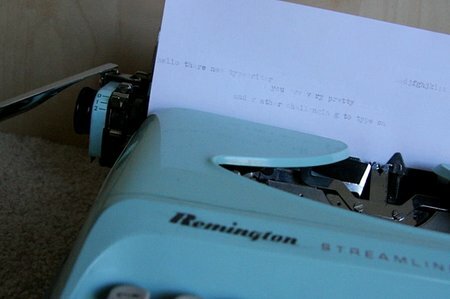 Then, what do you know, I added, "Except for a blue typewriter." 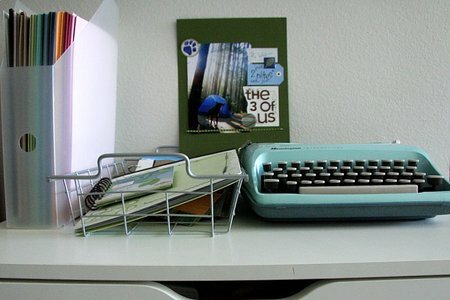 All summer I've been somewhat obsessively searching Craig's list and ebay for a vintage 1950's-1960's era aqua or baby blue portable manual typewriter. Yes, I was very specific in my search. Why did I need a typewriter? To type on scrapbook pages and little labels. And just because I wanted one. I have bid on probably 10 such typewriters this summer, only to lose the auctions because of my lack of attention to closing bid times, or to my cheapskate-ish-ness. Then, only days after I swore off material goods, I suddenly won an auction. I wasn't going to bid. But I did. Turns out, I was the only bidder. Starting bid: $9.99. Selling price: $9.99. With the $21.00 shipping, it was a steal and worth the wait. Still, I felt bad. The day after we starting moving back in, I got home from work and UPS had delivered yet another material object to us amidst a sea of boxes. Sigh. Maybe if I work extra hard to get rid of 3 other items I own but never use, I can repent of my materialist guilt. I feel guilty. But not that guilty. The typewriter is so lovely to me. Matt always tries to make me feel guilty for buying things for myself before my birthday or Christmas. He has a point. But I keep doing it anyway. Again...sigh. In other moving back in news, Miss K has done exceptionally well dealing with all this chaos, and overall seems very happy to be back home, near her beloved dog park and dog friends. The same day my typewriter arrived, the contractor stopped by to look over all the renovation mess-ups. Not sticklers for details in what we are calling our "faux luxury" apartment renovation. "Faux luxury" means granite counter tops flanked by laminated pressed wood cabinets with smashed corners and crooked doors. Our new refrigerator came with a door facing the wrong direction so we could barely open up the door without jumping up on the countertop. Before the contractor switched the door, Matt emptied all the food out of the door which allowed the Butter Bandit to strike again. I had to chase her into the living room. 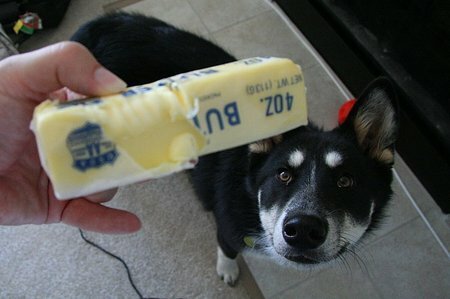 Luckily this stick of butter was still solid so she couldn't slurp it down as quickly as the last two. So, in closing, the re-moving in process moves forward. Now I'm trying to resist filling up my new refrigerator with more food than two people, and a sneaky sneak of a dog, could ever consume. I'm not really succeeding. 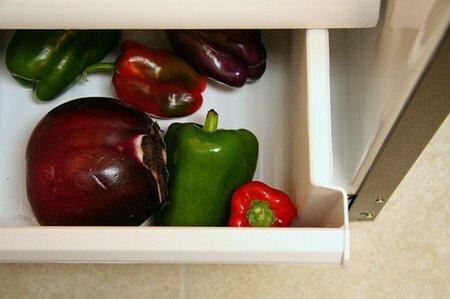 But, boy do those vegetables look lovely in my new fridge. I'm trying to not be in denial that it's already the middle of July. So much to do before I got back to school in late August. Especially now that we have to move out of our apartment completely for two weeks because our unit is being renovated! We spent the last couple weeks immersed in serious dilemma over whether to find a new apartment in another part of the Boston area, even though apartment prices are even higher in other areas of metro Boston, or whether to put up a fight so that our unit's renovation could be moved up to mid-August instead of right as I'm starting my semester. If we'd gotten this news before we got puppy girl, we probably would have left. That dog park has become indispensable though. The night we decided to stay here and won our renovation schedule battle, a bunch of us dog park people took a big field trip out to Stoddard's. Despite the incredible hassle, it's worth staying for the little community that we have here. It's not the right time to start over. 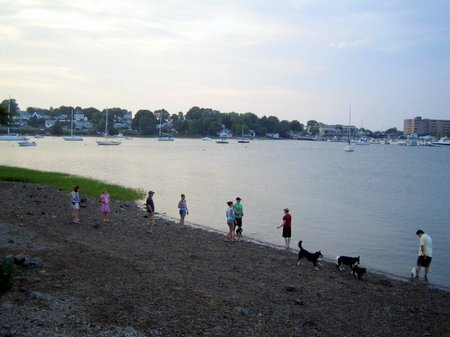 And, could there be a lovelier place to take your dog to burn off some energy? Hard to leave that behind. Still, we have to move all of our stuff out, and live somewhere else for two weeks, then move everything back in. Slight inconvenience. We're trying to look at it as the opportunity for the ultimate spring cleaning. We've become selling things on Craig's list, yet we feel we've just begun. The free time I planned to have this summer that isn't being spent on the puppy, will now be spent going through all of my worldy possessions, deciding what's worth keeping. And also, getting around to those pesky little to-do items I've been putting off for no good reason. It's a little bit of scrapbooking prettiness adhered to an old playing card. She designed the scrapbook paper herself and I think you can buy her stuff at SIStv. Three months later, I'm finally reciprocating. I don't know why I've put this off so long. Silly really, as it took all of 20 minutes and I enjoyed throwing something together. Here is my first artist trading card, ready to go in the mail tomorrow morning. I did not design that scrapbook paper myself. That would have been impressive. And since it's Sunday, here is my One Local Summer meal for the week. Pizza again? Yes, pizza is a staple around here. This Friday I sent Matt to the farmer's market. He picked up some really good Italian sausage from Stillman's booth. He also stopped by Schoolhouse Pizza to get some handmade mozzarella. The owner sells his own mozzarella for $2 a ball. Love that man, even though I've never met him. The dough came from Portland, Maine, a bit outside of the 100 mile radius, but not bad. I pulled the last of the pesto I froze last summer. Part of our mission to empty the freezer asap. Then, I had some green beans still hanging in the fridge from Ward's Berry Farm, so I thought what the heck. 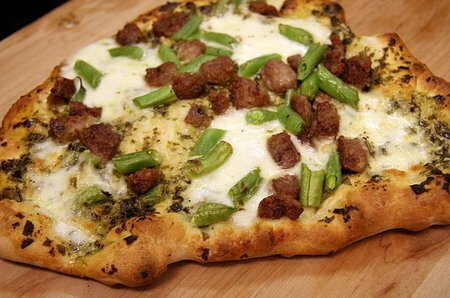 Pesto pizza with Italian sausage and green beans was created. Maybe I'm the only person to ever create such a thing. Sounds weird. Heck, it is weird. But the pizza was tasty, and I'd make it again. Part of moving will also mean letting some things go this summer. I never did make it back to pick strawberries. But, with what we're headed for, I don't think a freezer full of strawberry jam and local strawberries would have worked out anyway. Luckily, we'll be back in our apartment in time for blueberry season. Last fall, I went through the frozen blueberries so fast that it'll be a blessing to have an empty freezer ready just in time!